I took a bit of a blog break there... and then the last couple days I have been thinking, I can't post to my blog yet, the doll isn't all the way finished! I will post about her later; I just need to finish her feet. 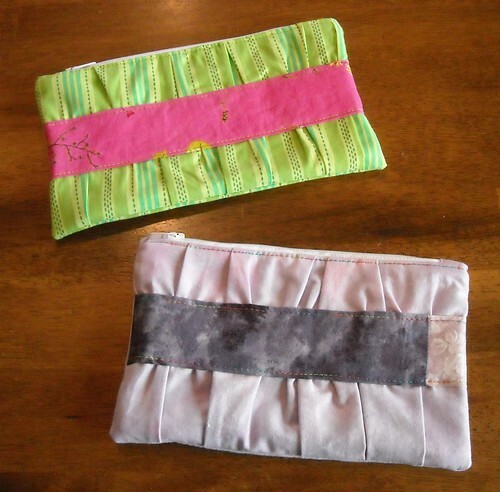 Gathered clutches. Pattern is from noodlehead. The green one was for my niece who is almost 13 (she's a New Year's Eve baby, we were partying hard (and impatiently) while her mom was in labor!) and loves lime green and all neon colors. My sister-in-law LOVES purple more than most people like their favorite colors, so it wasn't hard to choose colors for hers. I like how these look (love the gathers) but I am still a bit stumped by the zipper. If anyone has tips or tricks for the zipper tabs on this clutch that work really well and easy and it turns out great, please let me know! One for my mom, one for my mother-in-law. I had seen a couple of plus quilts on blogs/flickr and used this one as an inspiration when I drew up the diagram for these. I used a jelly roll of Merry and Bright for these, it's a Moda Christmas line from 2008. I love the ribbon candy print, and all the holly leaf fabrics too. I still have a lot of the jelly roll left, and a pillow form that I bought for myself; I still need to decide if I'm going to make my pillow with this same pattern or something else. The white squares all have written/drawn messages from the other young women/leaders. The girls helped sew it together, too. I quilted it and got it bound barely in time for church yesterday. You really do need to use fabric markers; I'm glad I found that out by testing a swatch with my son's permanent bic markers. We had a wonderful Christmas here. Kids got great gifts and our big family thing, the new TV, is being delivered tomorrow. 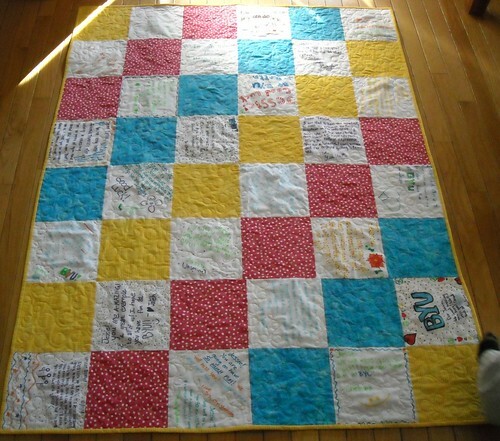 My mom made quilts for 6 grandkids this year, including my two boys, and I'll show you the quilts she sent soon. They are really cool. I only made one loaf just to try the thing out, and to try out the recipe. I grew up making 6 loaves of bread at a time--starting around age 10 I made that much bread at least once a week (for a couple years, not my whole life :) ), so it felt a little wrong to mix up the dough with barely 4 cups of flour. 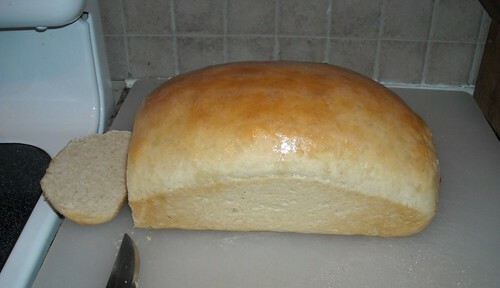 This one's all gone now anyway so maybe tomorrow I'll make 2 loaves. I have to say I made a couple of very silly mistakes in the kitchen today, I'm too embarrassed to say more but I've got to pay more attention. I loved how quick and easy it was to mix the bread dough, and I'm looking forward to mixing up cheesecake in the Kitchenaid tomorrow! Hope you are having a wonderful holiday season! 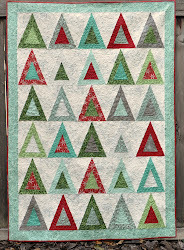 I've started my next quilt already :) and am thinking about the UFO pile and New Year's goals, projects, dreams, wishes. And I'm working on my first quilt pattern. I really like this one; I think you will too. Vicki, you've totally been busy! Wow! 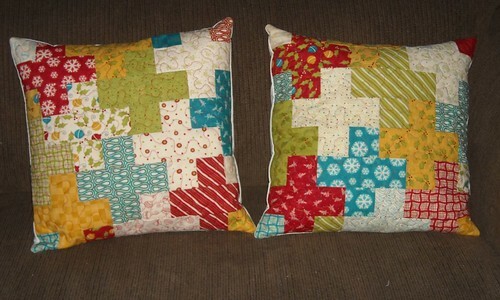 Love the pillows ... may have to try them myself with some jellyroll leftovers. Thanks for taking time to share and darn, I bet that bread was de-lish! That kitchen aid looks like a dream! I keep pointing them out to the man of the house...but alas he hasn't quite got the hint yet! Enjoy it and I look forward to hearing more about your bread baking! you will LOVE your mixer! That bread looks delish! I love your YW graduation quilt so fun;) Enjoy your Family this week! I LOVE that color too! 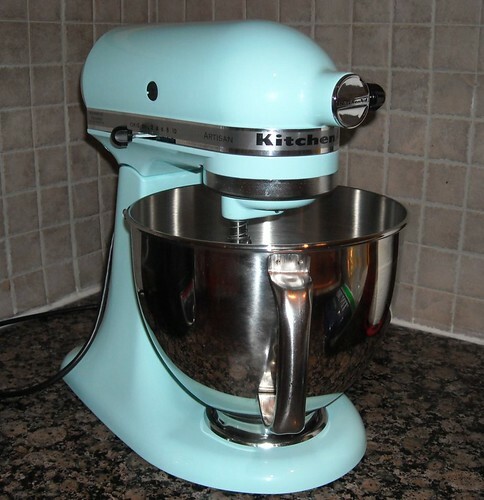 If I were to get a new kitchenaid right now, I would go with that color too...since it would match my dishes. Very purty! OMG!!! I simply love the pillows and the mixer. I have been wanting one of these mixers for years and just keep telling my self i really don't need it. I don't even have a mixer right now but I am going to get one soon! I am thinking the red one.